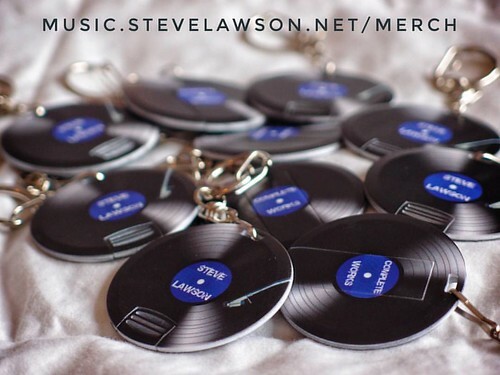 New USB Stick Design Now Available – 33 albums for 30 Pounds! Ever since Lobelia first bundled up her back catalogue on a USB Stick when we were on tour about 8 years ago, and I copied her, it’s become by far the most popular way for people to get hold of my music. When we first started, we were buying USB sticks out on the road, calling into Office Max or Fry’s to see what we could find (on one tour, I had a load of superhero figurines! ), but a few years back I started custom designing them, in limited edition batches of 50. Once they were sold out, that was it, move on to a new design. Today the latest design arrived – it’s actually very similar to a previous one, in that I’ve gone with the faux-mini-vinyl look again, only this time I’ve added a turntable arm to the image just for fun. However, what’s inside is the thing that keeps growing, It’s now 33 albums for just £30 and the collection of music has got so big that the accompanying live concert video is now on the stick as a download link rather than the file itself. I’m going to have to go bigger than 4Gb next time! …anyway, that’s a lot of music for precious little money, and it sustains the music that I make in ways that streaming services and YouTube royalties could never ever achieve. If you’re going to make niche music (and let’s face it, playing bass on your own is about as far outside the pop mainstream as you can get, regardless of how catchy some of the tunes are) there’s not yet been a version of the streaming economy that leads to a sustainable music making life. But likewise, there’s also no reason why you should have to pay £10 for a CD every time I make some new music. I make a LOT of music, and I’ve already made a lot of music, so if I can bundle it up in useful ways, so much the better.